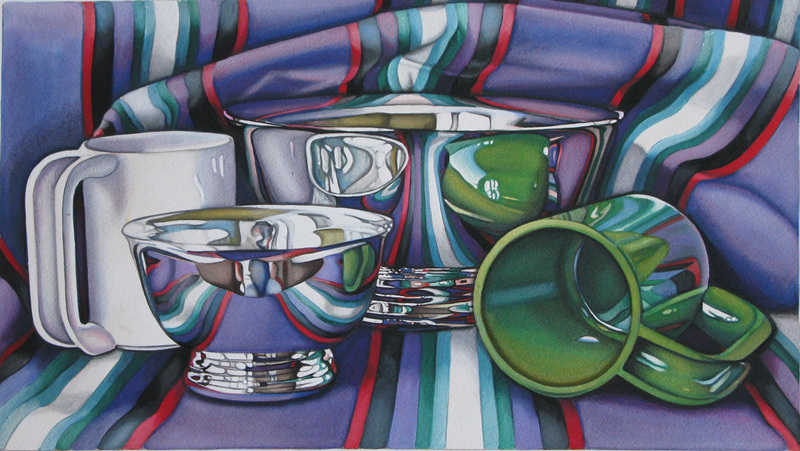 Jeanette Pasin Sloan’s paintings, drawings, and prints display technical feats of virtuosity. 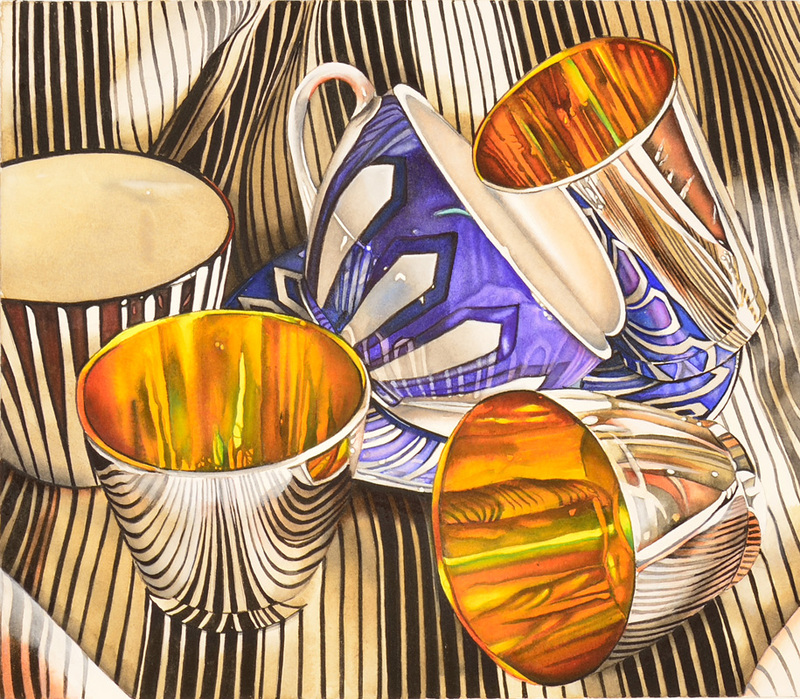 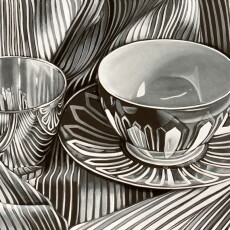 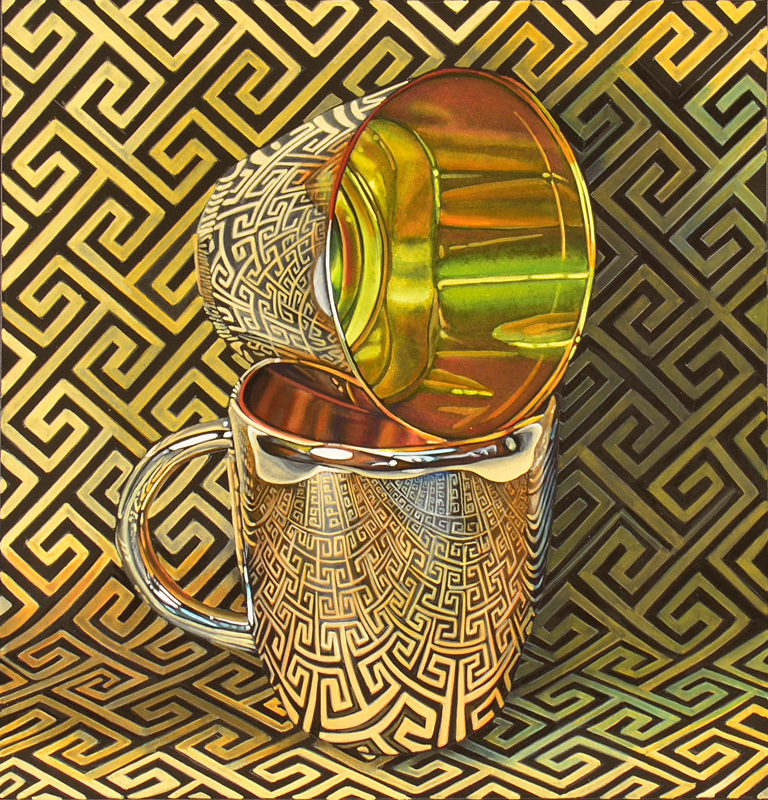 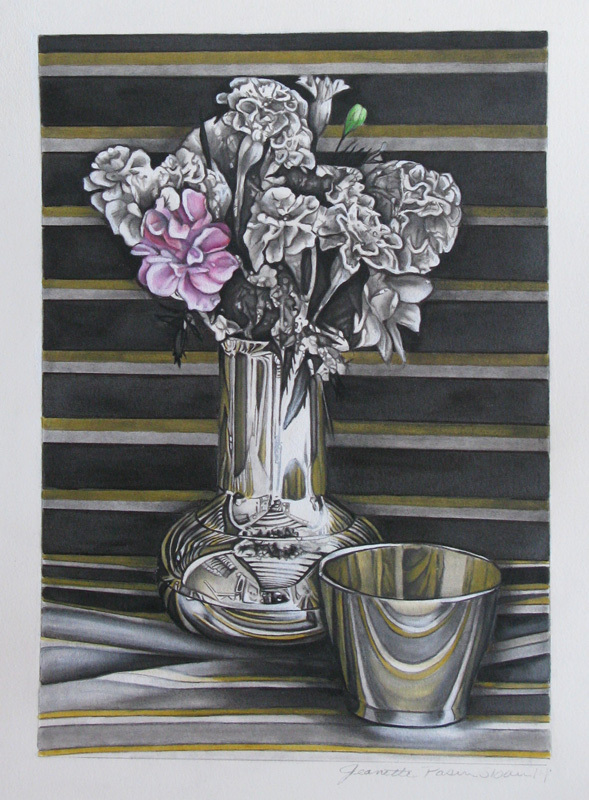 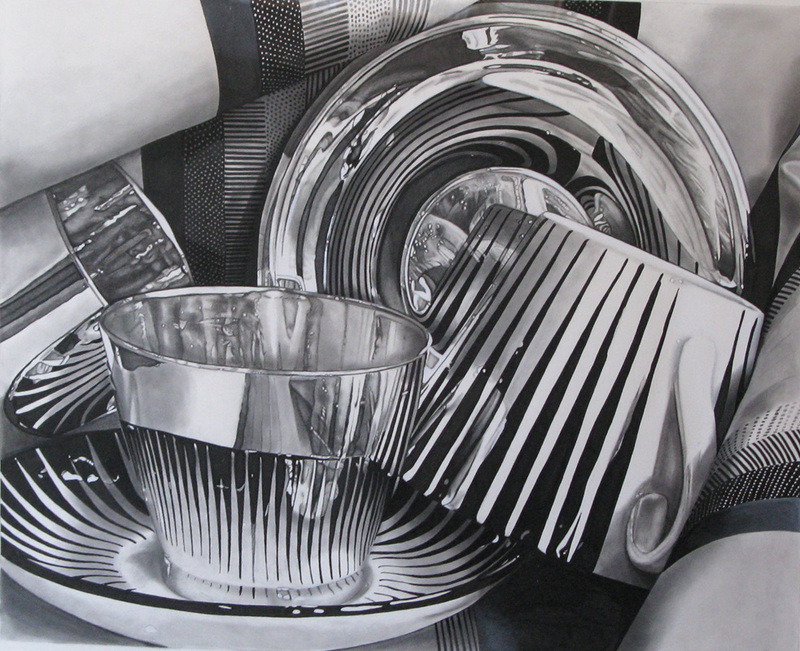 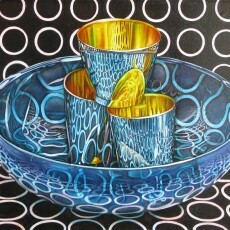 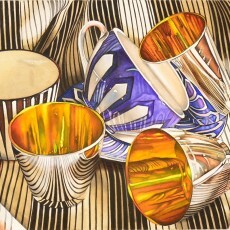 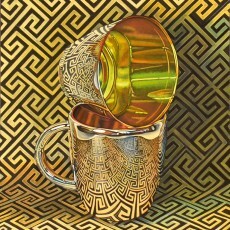 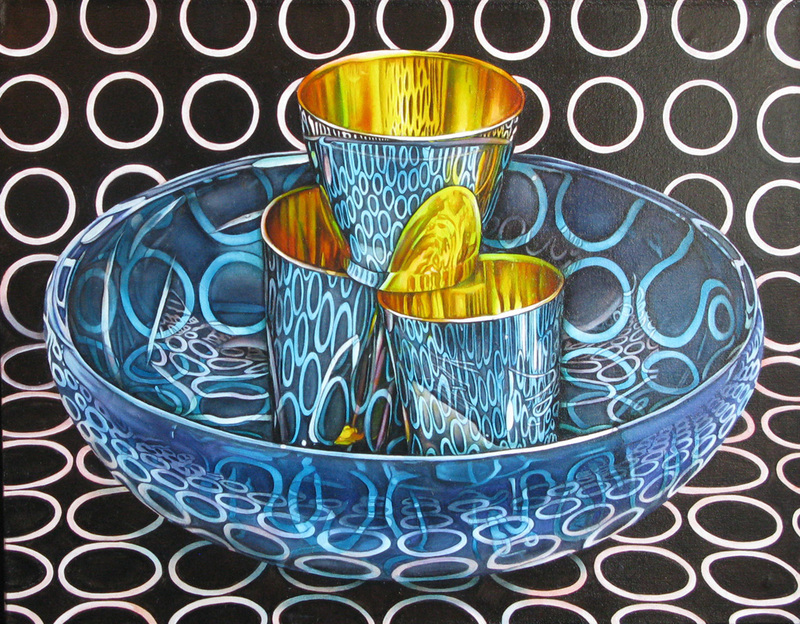 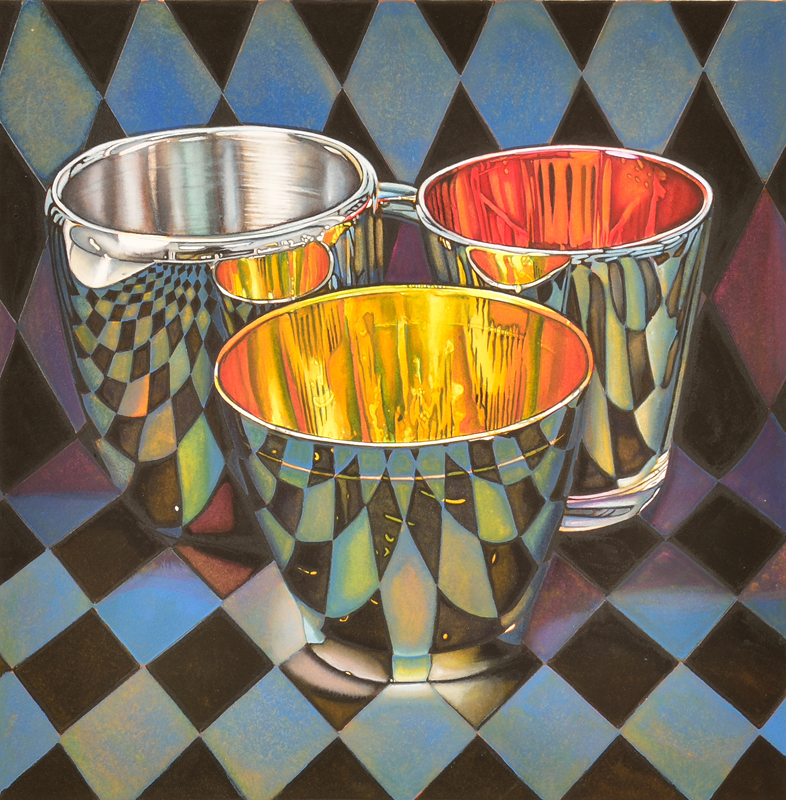 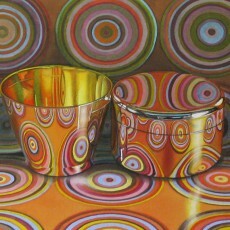 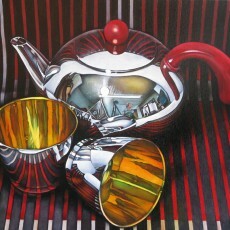 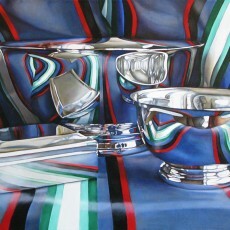 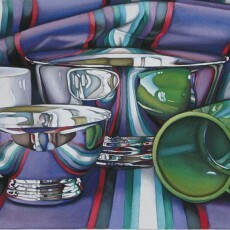 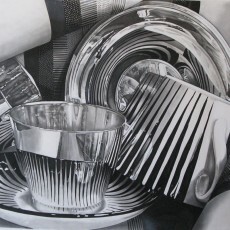 The artist uses a photo-realistic style to depict reflective objects set against patterned backgrounds. 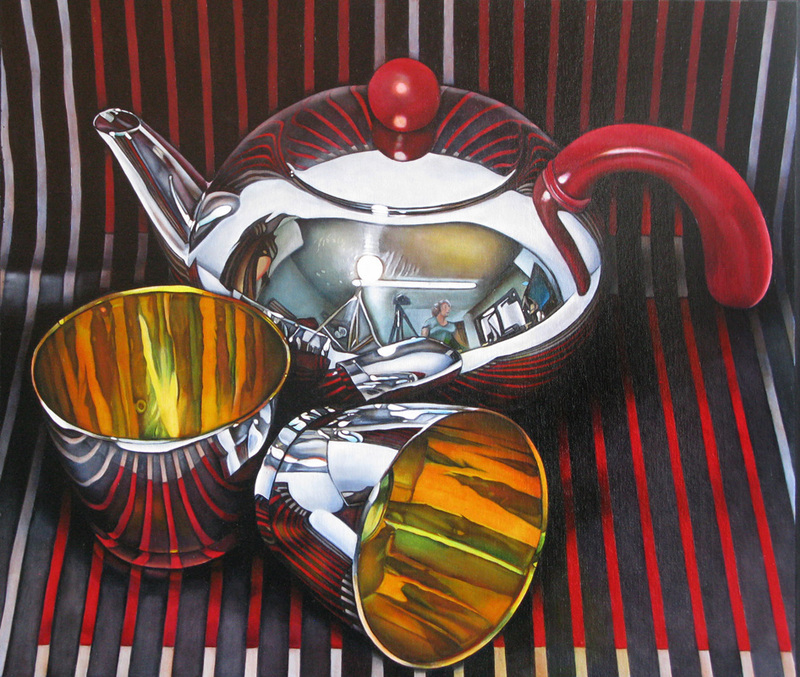 However, she subverts both genre and style, infusing the traditional genre of still life painting with highly abstract tendencies. 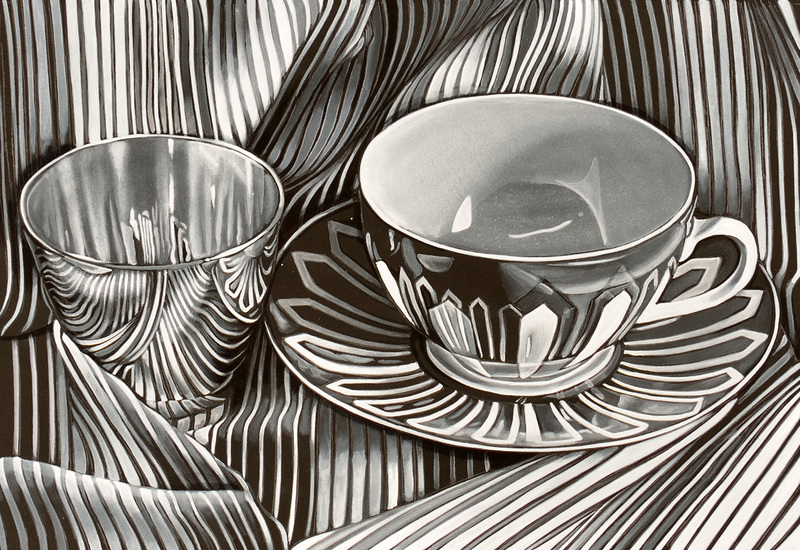 Closely-cropped, and set in carefully manipulated compositions, the subject matter of Pasin Sloan’s work takes second stage to its formal intensity. 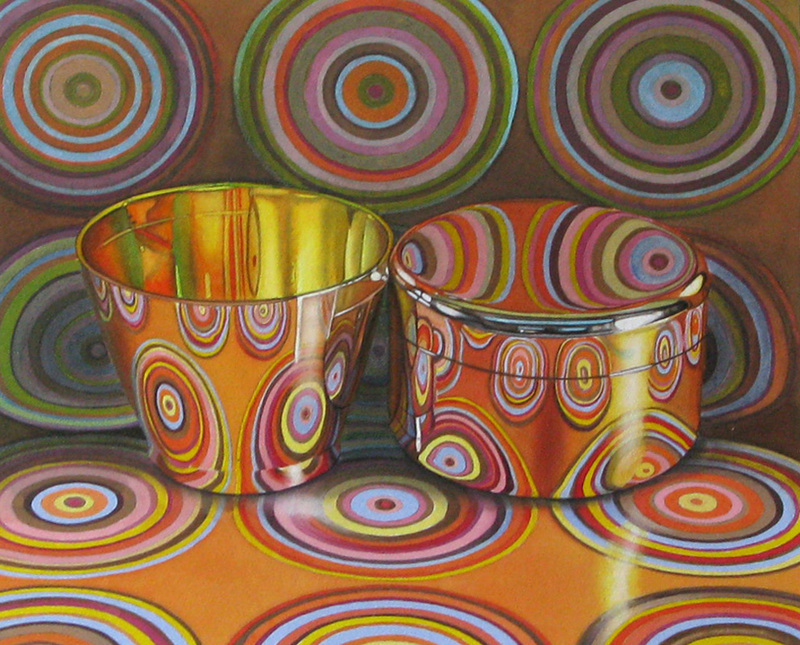 Pasin Sloan was born in Chicago in 1946. She graduated from Marymount College, Tarrytown, New York, and received an MFA in graphic arts from the University of Chicago. 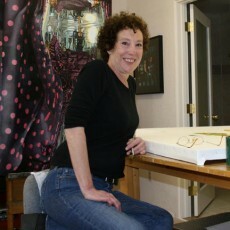 She has produced numerous editions with Landfall Press since 1978, including Expresso Cups and Club State II. 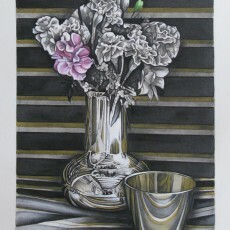 Recently, Pasin Sloan completed a lithograph entitled Alignment for Landfall Press’s 30th Anniversary Portfolio. 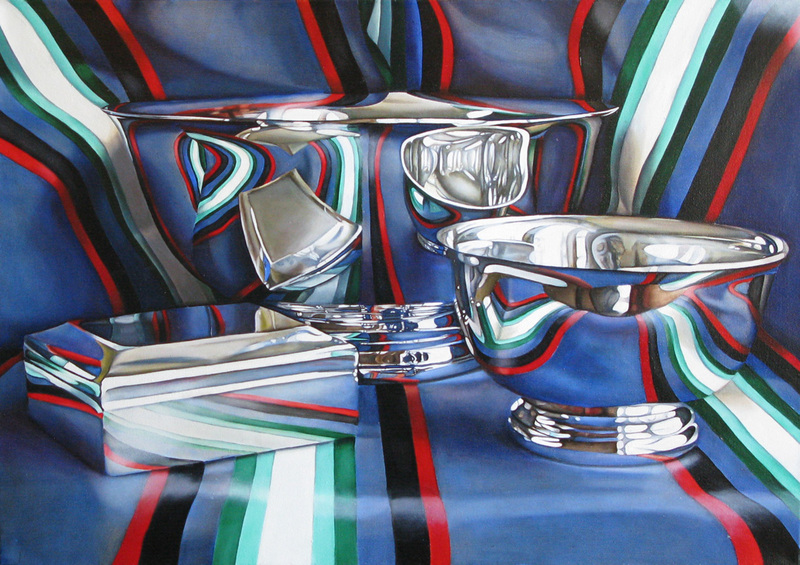 Jeanette Pasin Sloan’s work can be found in the Metropolitan Museum of Art, New York, The Art Institute of Chicago, Cleveland Museum of Art , Elvehjem Museum of Art, University of Wisconsin-Madison , Federal Reserve Board, Washington, D.C. , Fogg Art Museum, Harvard University, Cambridge, Massachusetts , Harvard University, Cambridge, Massachusetts, Indianapolis Museum of Art, Indianapolis, Indiana , Kansas City Art Institute, School of Design, Kansas City, Missouri , Milwaukee Art Museum, Milwaukee, Wisconsin , Minneapolis Institute of Arts , National Museum of American Art, Smithsonian Institution, Washington, D.C., National Gallery of Art, Washington, D.C. , New York Public Library , David and Alfred Smart Museum of Art, University of Chicago , Snite Museum of Art, University of Notre Dame, Notre Dame, Indiana , Yale University Art Gallery, New Haven, Connecticut , to name a few.